Also issued on microfilm from New York Public Library. Vol. numbering irregular: Vol. 7, no. 7-v. 8, no. 6 omitted. Official publication of the Jewish War Veterans of the United States of America. Copyright Jewish War Veterans of the United States of America. Permission granted to University of Florida to digitize and display this item for non-profit research and educational purposes. Any reuse of this item in excess of fair use or other copyright exemptions requires permission of the copyright holder. Volume 71 Number 2 2017 Military Perspective of Isreal Creates Unique Trip Front Page Jewish Warrior Weekend Front Page Review: The Face of Battle Page 3 NEC Paul D. Warner Announces His Candidacy for National Commander Page 7Register Now! 122nd Annual National ConventionPage 9 A Lay Leader's Journey into the Jewish Faith Page 10 Women Veterans -Sisters Under the SkinShare Experiences During VA Gatherings Page 11 "And Then There Were Three" Lon g Beach, CA, VA Medical Center Renamed for Tibor Rubin Page 22 JWVA NewsPages 18-19Jewish Warrior WeekendBy Nelson Mellitz, narrated to Cindy Chambers If you are a military enthusiast, served in the Armed Forces, or studied the Israel Defense Forces (IDF), then you want to go on JWVs Allied Mission to Israel. What makes this trip unique is that it is a Mission, not a vacation. Its purpose is to bring veterans and their familiesJewish and nonhand look into Israels military, security, and safety. I last visited Israel four years ago with my synagogue and it was a completely different trip. On JWVs and had extensive visits with active duty and retired personnel from the IDF. Really, the entire perspective was different. We were viewing the cities as fortressesthe layout, the topographyhow did people defend themselves? How do you structure your life around possible missile strikes? The conversations are unique to Israel and ones we wouldnt have been able to have elsewhere. After many days of learning so much military history, the culminating highlight for me was Akko, the impressive underground Crusader city. It had huge, high ceilings and the walls were all reconstructed by the Israelis. Usually Crusaders simply attacked, By Dr. Barry Schneider Ft. Worth Post 755 Twenty-two cadets from the Air Force Academy, Virginia Military Academy (VMI), Amherst, Princeton, and Colorado State met for a weekend of comradeship and learning at the annual Jewish Warrior Weekend: Aggieland, which took place from April 14-16, 2017 at Texas A&M University. Three of the four military branches were represented. The cadets arrived in College Station on Friday and celebrat ed Shabbat at Hillel with a wel come from Brigadier General Joe Ramirez, the Commandant of the Corps of Cadets. He expressed great appreciation for everything Jewish military members have done for the country from the beginning at New Amsterdam to the present. After a lecture and update on Middle East politics from Andrew Ashford of AIPAC, the cadets were treated to a late night showing of True Honor, a documentary about Jewish Medal of Honor Recipients Continued on page 15 Continued on page 14Military Perspective of Israel Creates Unique Trip Major General Norton Schwartz, center left, posed with the cadets after his keynote address. Barry Schneider, second from right, was on hand to help answer questions about JWV and provide support. Photo credit: Danielle Freedman, Texas A&M Hillel. Wreath laying ceremony on Yom Hazikaron (Memorial Day), at IDF Armored Corps Memorial at Latroun. From left: IDF cadet, NC Carl Singer; LTG Christopher L Powers, Ret., Texas National Guard; Robert Looby, American Legion New Jersey, Vietnam Veteran. 3 By Cindy Chambers and Jordana Green Laurent The National Portrait Gallerys The Face of Battle: Americans at War, 9/11 to Now exam ines the toils and tribulations of modern warfare in the lives of U.S. service members. The six in stallations, ranging from photography to audiovisual, capture moments of pain, boredom, and camaraderie. Death, in all its oppressive forms, lingers through the entire collection. The exhibits introduction reminds us how military service has now become an integral part of advertising campaigns for everything from beer to trucks to real estate; the veteran as a product placement vehicle speaks of a business-as-usual mentality that puts us in danger of losing any sense of what it means to have been in combat. To combat this danger of sensory deprivation to combat, the exhibit brings the faces of war front and center by literally showing us the hu manitythe good, bad, and uglyof war. Bedrooms of the Fallenby Ashley Gilbertson almost inviting. Everything is familiar. The bed rooms of young adults in US workingto mid dle-class suburban homes. The bed with a near by nightstand, paperbacks, computers, school pillow. But then you begin to notice the age of the room. There are posters for movies that released six years ago; a class of 2013 high school letter man jacket; unopened Christmas presents in the corner. The bedrooms are unoccupied both in the photo and in the homes. Reading the captions on each print, you learn the bedrooms housed U.S. service members be fore they were killed in action. The human cost of war is never more apparent than when you rec ognize that the service member died two to six years ago, but their family has left the bedroom untouched. As if a personal museum exhibit, the room expresses the service members hobbies, religion, musical tastes, and all those habits that make up an individuals personality. Gilbertsons choice of black-andwhite prints, over color, only further locks the room in time. As much about grief of war, Bedrooms of the Fallen reminds you of the importance of kind ness. Crawling through pharmacy, or listening to your Post members recitation of his day, all these moments are being lived by someone who might be grieving or trying to move forward. Homage to 2nd Lt. John Holt Jr. by Vincent ValdezThe sole exhibit with a mixed media approach, Vincent Valdezs work speaks through sight and sound. You are immediately drawn to a video ing across the screen with rotating images of an urban American neighborhood in the background. Speakers blast And the Band Played Waltzing Matilda, an anti-war Irish punk song by The Pogues. It is jarring and upsetting, so by an oil painting that stretches across two-thirds of the wall. Appearing al most photo-like, the close-up of an army soldiers battle-weary face con veys the trauma of war. When you see the display case housing a tri-fold exhibits message, not as a whisper, but as a blunt club to the face. War broke this soldier down and ultimate ly took his life. Valdez explained that the featured soldier, John Holt Jr., was a good friend and dutiful citi zen. After serving a tour in Iraq as a combat medic, 2nd Lt. Holt Jr. returned home suffering from PTSD. Before deploying for a second tour in 2009, he died by suicide. Duty and loss ring forth in this homage to John, friend of Vincent, atten dant of the wounded, and one of our fallen heroes.A Soldiers Life by Stacey PearsallAir Force photographer Stacey Pearsall noted, Ive often heard war described as perpetual boredom punctuated by moments of sheer terror. Ive seen and documented both. One of the few female combat photographers, she has worked in more than forty-two countries, including serving three tours in Iraq. Pearsalls lens captures the social moments and comradeship of life behind the front lines, as well as the pressure of soldiers as they wait for the inevitable patrol or mission. In Apple Pie & Baseball, a young soldier practices Americas national pastime. He swings a bat with a look of intense concentration, allowing you to momen tarily forget that he is standing in front a tank and could be seconds from danger. By living, eating, sleeping, and grieving with her subjects, Pearsall broke down the boundaries between soldier and photographer. What emerged were raw photos showing the humanity and emo Christopher Scherer by Ashley Gilbertson / Pigment print 2009 (printed 2017) Ashley Gilbertson/VII Photo, Ashley Gilbertson/VII Photo. Review: The Face of Battle John by Vincent Valdez / Oil on canvas 2010-2012 Courtesy of the artist and David Shelton Gallery, Vincent Valdez.Continued on page 15 Apple Pie & Baseball by Stacy L. Pearsall Aluminum print 2007. Courtesy of the artist. 4 my last opportunity to reach out to you in The Veteran as National Commander. It's been a good yearI've had the opportunity to visit several Departments and Posts, and have more on my schedule for May and June. I just got back from the JWV Mission to Israel. What a great tripI hope each and every one of you signs up for next year's Mission. Take 44 people, one bus, a great driver, one outstand ing tour guide AND a beautiful country, stir gen tly, and you have the JWV Mission to Israel. We participated in both Israel's Yom HaZikaron (Memorial Day) and Yom Haatzmaout (Independence Day), attended memorial services for the Border Police, and participated in a wreath laying at Latrun for the Armor Corps. Im writing this column on May 7, 2017the 72nd anniversary of V.E. Day. This morning, I attended the Department of New Jerseys 36th Annual Legislative Breakfast. When I asked the World War II veterans to raise their hands, it turned out that there were only three in atten dance. We owe a great deal to our World War II veterans and for many years they have provided us direction and guidance. Wars result in new generations of veteranseach with unique cir cumstances and challenges. JWV is a respected and trusted voice of American Jewryweve paid our dues. We must be advocates for veterans, for Jews, and for Israel. Our veterans have earned their keep. Service to veterans is not an entitlement or a giftit is a debt the nation owes us. Being a veteran is an honorable, respected distinction. I've seen this many times in my travels. Change is vital to any organization, but we There's a hidden "that's not the way we've always ing, let alone adopting, new ideas. This mindset must be overcome. Time and again I hear that we will fade away and the museum (The National Museum of American Jewish Military History) will be our legacy. However, the actions we take today will greatly affect our countrys future. Recruitment and retention remain key to our survival. We must keep track of our members to retain and recapture their participation and in different communities away from their old friends. We must enable and enhance dual-post membership. In New Jersey, for example, our big city posts have withered as members have moved to retirement communitiesand one in six of members live out of state. This calls for reexam ining our membership model. We face many challengeslet me highlight For some young veterans, we need to help them navigate the VA System. Many suffer from PTSD and other service related maladies. Some civilian careers. Some are looking for positive volunteering opportunities to help other veter ans, and some simply are seeking a social out let to join with other Jewish veterans. We must understand their varied and diverse needs as we integrate them into our organization. On the other end of the spectrum, we must support our aging members. Whether its giving them a ride to a meeting or simply calling or stop ping by to see how theyre doing. Many posts hold meetings where more members are absent then present. We must reach out to the empty chairs. We need to continue to provide service to all veteranswhether its at the VA hospitals or the nursing homes or on the streetswe must con tinue to help our fellow veterans. It is the right thing to doone homeless veteran living on the streets is one too many. Helping veterans is also our greatest recruit ing and retention tool. Members who get involved help ing veterans stay involved. Lastly, there is no place for anti-Semitism in support a strong, safe, and secure Israelwe must remain a strong voice in that regard. The underlining message is that we must communicate and we must innovate. We do many great things, but theres always more to do and possibly newer and better ways to do it. I will continue to work with you as we continue to build towards the future. As the public representative of this wonderful organization, I continue to put our best foot forward when meeting with a JWV echelon or testifying before a joint Senate and House veterans commit tee. Id like to thank the many who have helped me over the past year: Past National Commanders, Past National Presidents, Department Commanders, Department Presidents, Post Commanders, Auxiliary Presidents, and lots and lots of hard workers. Everyone lent a helping hand and encour agement as needed. A special thanks to Herb Rosenbleeth and his outstanding team, our dedicated professional staff, who are here for us all year. You all make Thanks also to my Chief of Staff, Nelson Mellitz, and my Chief Aide, Bernie Epworth, who have the unenviable task of trying to keep me out of troubleI thank them for the efforts, their advice, and their friendship. To everyonecome to San Antonio for our National Conventionyou'll be glad that you did. God Bless the United States of America.National Commander COL Carl A. Singer FROM THE COMMANDER MESSAGE A Look Back On A Memorable Year! 5 On March 22, 2017, National Commander sion of the Senate and House Committee on Veterans Affairs. NC Singer presented the leg forming Congress of our position on a number of crucial veterans issues. The co-chairs of the committee are Senator Johnny Isakson (R GA) and Congressman Phil Roe, M.D. (R-TN), each of whom have many years of service with the Veterans Affairs committees. NC Singers introduction spoke of JWVs 120 year history, our strong VAVS program, hosting of educational programs, and support ing patriotic organizations like Boy Scouts of America. He emphasized that the VA must be kept intact, expanding to private care only when VA care is unavailable. He stressed that extend ing the Choice Act deadline cannot mean priva tization. NC Singer said, JWV believes that the best healthcare is at the VA. JWV is a strong advocate of equal treatment for female veterans, and NC Singer further empha sized the need for VA improvements in the treat ment process for Military Sexual Trauma (MST). Another issue of great importance to JWV is the plight of our homeless veterans. NC Singer acknowledged that while the VA has made great strides in reducing the number of homeless veter ans, even one homeless veteran is one too many. JWV supports passage of the Military and Veteran Caregiver Services Improvement Act of 2017 (HR 1472/S594) to expand care-giver eligi bility to include full-time pre-9/11 veteran care givers. These caregivers save the VA healthcare costs and give the veteran desired personalized treatment. NC Singer stated that JWV strongly supports continued research and treatment for service-related toxin exposure. When veterans have been exposed to toxins while on active duty, they and their families must receive proper care and treatment, no mat ter when the toxin effects appear. Toxic related illnesses may appear at any time, even decades later. Delayed harmful effects of toxins may be seen from Agent Orange (JWV supports the Agent Orange Extension Act of 2015), from con taminated water (JWV supports the Honoring Americas Veterans and Caring for Camp Lejeune Families Act of 2015), and from exposure ex perienced by our Vietnam War Navy Veterans. JWV also supports the Blue Water Navy Vietnam Veterans Act of 2017 (HR 299 and S422). Prevention of veteran suicide is one of the most important issues for JWV. The VA reports that on average, 20 veterans a day die by suicide. This is unacceptable. JWV and NC Singer strongly urg es Congress to pass the Sgt. Brandon Ketchum Never Again Act (HR 874). The provisions of this act would help ensure same-day treatment for vet erans calling in to the VA crisis line. The topics mentioned above are just a few of JWVs Legislative Priorities, which are our goals and topics of concern for Congress. The priorities initially start as Resolutions, which are voted upon by the Department. Any Resolution that passes at the Department level is forwarded to National for further discussion and debate at JWVs annual convention. Those that are voted on and passed by the general body become the policies of our organization and are the basis for the Legislative Priorities. Stay tuned for more information about how to submit Resolutions and participate in our 2017 Convention Resolutions process, even if you are unable to join us in San Antonio. All JWV members are encouraged to participate in this DISPATCHES FROM THE EDITORPNC Monroe Mayer, National Editor NEWSHerb Rosenbleeth, Colonel, U.S. Army (Ret)FROM THE NATIONAL EXECUTIVE DIRECTOR National Commander Carl A. Singer presenting JWV's Legislative Priorities before a joint Senate and House Committee on Veterans' Affairs on March 22, 2017.As the days get longer, and the sun rises earlier, we will be simultaneously meeting for our Department and Council Conventions. Part and parcel of those important meetings will be most importantly, the exchange of ideas and the submission of proposed Resolutions. It is up to us, for JWVs future, to meet and vote for our representatives and bring what is considered at these meetings to the National Convention in San Antonio, Texas later on this summer. For the future, please remember that these events are the life line of our organization. In addition to these important occurrences, we will also be involved in Memorial Day and Independence Day ceremonies. Many of our groups participate in events within their local communities, and also celebrate with the other veteran organizations. Participation is certainly the order of the day, in both Conventions and Ceremonies. It will demonstrate to all that JWV is still active as one of the oldest active veterans organization. This will be important to our members, our fellow coreligionists, and other participants in these act as Color Guards for observances, collect money for poppies, and do so much more to make sure our veterans are recognized. If you see them in your community, say hello and thank a veteran for his/her service. Being involved in local events demonstrates to onlookers that we must take care of our veterans, maintain the VA medical centers and hospitals, and most particularly, remind our Congressional representatives that they also must provide for veterans as they have promised. Write to your representatives, call, and/or email to help advocate for better care for our nations heroes. It is what they deserve, and what they have earned. 8 Spanish expeditions in 1691 and 1709. The town itself was founded in 1718, as was the San Antonio of Spanish Texas in honor of the Portuguese Catholic Priest Saint Anthony of Padua. By 1778, the town had a population of 2,060. The missions were all secularized by 1795, and San Antonio de Valero Mission (later, the Alamo) became a military barracks. The Alamo is best known as the site of the most infamous battle of the Texas Revolution when Mexican troops under President General Antonio Lpez de Santa Anna massacred the citys Texan defenders over the course of a 13 day siege in 1836, leaving no survivors. San Antonio was seized twice in the Mexican invasions of 1842, and the population was re duced to about 800 in 1846. After the Civil War, San Antonio prospered as a cattle, distribution, mercantile, and military center serving the bor der region and the Southwest. The creation of the Galveston, Harrisburg and San Antonio Railway in 1877 helped San Antonio enter a new era of economic growth, with the population reaching over 20,000 by 1880. During both World Wars, San Antonio further established itself as an in dispensable city by contributing soldiers to the American war effort from Camp Travis and Fort Sam Houston, one of the Armys oldest installations. Due to its Spanish, Mexican, and German tory of patriotism, a robust culture, and a thriv ing art scene. As the second most populous city in Texas, San Antonio is a bustling metropolis which is visited by more than 20 million tourists annually and is home to multiple institutions of higher learning and art, such as the University of Texas and the San Antonio Museum of Art. The city has painstakingly preserved nu merous landmarks including the Unesco World Heritage Site at the Alamo (two blocks from our hotel), the Casa Navarro State Historic Site, and the King William Historic District. In the late 1800s, this 25-block area was settled by prominent German merchants and was the most sophisticat ed housing area in the city. There are also a variety of scenic sites and recreational activities available for families. The San Antonio River Walk stretches for 15 miles throughout the plethora of restaurants, shops, and histori cal locations, while 150-miles of city-wide trails weave throughout the urban area. Our hotel, the Hilton Palacio del Rio, sits right on the River Walkthe riverboat rides Likewise, the San Antonio Zoo, en compassing 35 acres and housing 3,500 animals, is positioned at the headwaters of the river while the 343.7-acre Brackenridge Park, Botanical Garden, and Japanese Tea Garden will thrill naturelovers of all ages. There is also El Mercado (Market Square), a three-block outdoor plaza lined with shops that is the largest Mexican market in the country. In terms of access and pub lic transportation, our hotel is a 20-minute drive from the San Antonio International Airport, and taxis and Ubers are plen tiful. Furthermore, the VIVA Metropolitan Transit system and the VIA downtown tran sit bus services have routes which connect downtown San Antonio with the citys various cultural and historical sites. We are fortunate in that our hotel is across the street from several metro stops located near the Henry B. Gonzalez Convention Center. We hope you will join us for JWVs 122nd National Convention in beautiful San Antonio We have lots more information available on our website including deadlines, airport transportation information, the meeting schedule, and the Show Us Your Badge program, which gives discounts to attendees who show their con here: http://www.jwv.org/events/convention. Welcome to San Antonio! Through San Antonios Show Us Your Badge program, convention attendees can receive discounts and special offers at over 50 restaurants and nightlife establishments in downtown San Antonio simply by showing their conference badge. Vietnam Veterans Night Out!Everyone is welcome to join us for an evening of good food, good fun, and comraderie. Contact Jerry Alperstein for details and to make your reservation. Our hotel also participates in this program, so bring your convention badge to the restaurant from 11:00 am to 11:00 pm for a 10% discount.Check out the JWV website for the complete list of participating venues. 12 JWV IN ACTION give back to their local community over breakfast. They also discussed issues of recruitment and retention and their ultimate goals for the Post. From left to right, Chaplain Richard Berg, Arthur Friedman, Barry Mishkin, Marvin Yellon, and Post Commander Richard Rosenzweig. On Sunday, April 23, 2017, members of the Rockland/Orange District Council were called upon to be the color guard at the Holocaust Museum Center for Tolerance and Educations Yom HaShoah commemoration. The event was held at the New City Jewish Center in New City, New York. Alan Moskin led the audience in the Pledge of Allegiance. Photo credit: Jeff Karg. accomplishments, spoke about BDS. Eric Fox, Senior Publications director, jet. The Post also awarded State Representative Daniel Goldman a plaque for his assistance in the F35 project and for co-sponsoring the Texas State Legislature Anti BDS Bill. Enjoying comraderie with fellow JWV members, Post 202 FL met on May 11, 2017 for a brunch meeting at a nearby restaurant. Following the annual reading of the Purim Megillah at the Manhattan VA Medical Center, sponsored by Manhattan-Cooper-Epstein-Greenwald Post 1 on March 12, hamantaschen were enjoyed by all including [from left] Department of New York Hospital Chair Mort Weinstein, National Edward Hochman. PNC Jerry Blum, Post 45 CT, presented Kiddush cups to Kyle Levy and Hannah Heichen, graduating Jewish cadets from the Coast Guard Academy. Norman Hanenbaum and Joanne Blum helped present books from the Jewish Welfare Board. 13 JWV IN ACTION veterans graves in honor of Memorial Day. From left to right at Greenwood Cemetery in front of the JWV Monument: Richard Chastain, Dept. of SE and Post 112 Cmdr. Robert Max, and Mr. Marc Urbach. Commander of Post 21, Robert Greene, turned his gavel over to the newly installed Commander Ed Turken. Marian Chudner renewed her term as President of the Womens Auxiliary. Members of Post 753 TX dedicate a bench at Ft Sam Houston VA Cemetery. The bench has the name of the services on the sides. Pictured from left to right are Herschel Sheiness, Arwin Wilson, Ken Ashworth, Ralph Wilson, Faye Swidler, Sean Sandlin, Garland Scott, and Steve Kohn. On April 6th 2017, Sheldon Turetsky (left) and Steven Schorr, Commander of MO-KAN Post 605, represented JWV at the Centennial Commemoration of the U.S. Entry into World War I. This 100th year celebration, one of many nationwide, was held at the National World War I Museum and Memorial, The Liberty Memorial, in Kansas City, MO. Photo credit: Sheldon Turetsky. Mat Millen of Post 118 CA presented the JWV Americanism Award to Cadet Daniel Hernandez at Thomas Jefferson High School on May 5th, 2017. Post members and Auxiliary members of Department of Connecticut served as the Honor Guard for a Holocaust commemoration service at Temple Beth El in West Hartford, Connecticut. 14 slaughtered, and moved on. But here, they built a fortress. It is an unbelievable sight and was quite a feat for the Israelis to rebuild. We interacted with both the US Military Attach at the US Embassy and the IDF at sev eral locations. The group at the US Embassy was impressive. They seemed to pull out the briefed us regarding the United States funding and involvement with blockades and settlements, and the partnerships between our two countries. It was not as detailed as most of us had ex as you experience the country. We spent time with members of the IDFs border patrol, as well as an armored division. Both experiences were so welcoming. The individuals who spoke with us and gave tours seemed genuinely happy to meet us, and were highly knowledge able. The tour of modern and old tanks at Latrun, the Armored Corps Museum and Memorial was just impressive. We even got into a long discussion about drone warfare, which I found particularly interesting as our own military is adjusting to this mod ernization. The spirit of camaraderie amongst the IDF soldiers is pres ent, thats for sure. Something new I learned: retired IDF can no longer wear a uni form. Only active duty wear uniforms. After you retire, you wear pins that denote your service. We also visited the 9/11 Memorial, which I had never seen before. The very fact that a 9/11 Memorial exists there not seen a memorial in America that lists every deceased American from all three sites (Twin Towers, Somerset County, and the Pentagon) in one place. The location pulls it all together atop a hill and the Israelis sculpted the landscape moving. Another new aspect of the trip for me was Tel Aviv. My wife and I were able to go out one night during some free timenow that is a happening The energy is great, with so many new buildings we had a great time and delicious food. As a tour ist, you go to Haifa for a calm, clean city. Tel Aviv is also a clean city that is great for tourists, but its so much more vibrant. I remember thinking that in Tel Aviv you never really know where anyone is frompeople come from across Israel, and all over the world to live there. Because Israel is so small, its rather easy to see the entire country in ten days, but we made a lot of pit stops along the way, which deepened the experience. Somewhere in the Galilee, we stopped by a kibbutz. You can get taken in by the big markets in Tel Aviv and Jerusalem, but handmade items. My wife and I had a good time picking up trinkets for the family, and now, I cant even place where we were. I guess thats the nature of a 10-day trip. Many trips to Israel dont discuss the coun try from a military perspectiveover thousands of years, the cities and towns developed based on ing to get that depth of discussion on Israeli mili tary operations, past and present, on any other tour. Military Perspective of Israel Creates Unique TripContinued from page 1to person. You cant just put an ad in the paper for your Postyou have to take the time to really get to know people. A goal should be to reduce late paymentsit is much easier to get current members to pay their dues than to recruit new ones. I cannot overstate the urgency to work on retention. This is your last column as Membership Chair. Any last thoughts you wish to share? I have enjoyed being your membership spokes man and hopefully your motivator in wanting you to recruit new members and in retaining existing members. I will always remember the friends and supporters that I made over the years of my tenure, and I want to thank all of you for making my job a wonderfully great experience. It is important to note that as of early April 2017, the retention losses are 1,436 members from July 2016. This represents a serious retention loss, up over 1,000 people from 2015. That said, recruit ment is still of vital importance, as new members are the future of the Jewish War Veterans. I look Membership CornerContinued from page 6 U.S. Military Deputy Attache' from U.S. Embassy, Tel Aviv briefed the JWV group on military cooperation and agreements between Israel and the U.S. Yom Hazikaron (Memorial Day), Armored Corps Memorial Center ceremony at Latrone, Israel. JWV leadership participated in the ceremony by laying at wreath at the monument. The group posed for a quick photo in Ben Gurion airport after arriving in Israel! The spectacular view from Mt Shaul Gilboa Forest Vista. 15 created by the JWV Department of California. The cadets were really taken with Tibor Rubins story and interviewthey loved his quote about praying to anyone who would listen. A special thank you to Greg Lee and the Department for Shabbat morning services were held at the College Station A&M Chabad house, which was followed by a great (Passover) lunch and learn session with the Rabbis wife. Throughout the day there were campus tours, speakers on leader ship, and a visit to the George Bush Presidential Library and Museum. It was clear that the cadets were engaged and attentive; they clearly appreci ated the opportunity to meet and talk with each other, military personnel, and veterans. Former Air Force Chief of Staff General Norton Schwartz shared his thoughts on service and leadership with the cadets, and the impor tance of making good decisions. Major General David Rubenstein spoke about how the military role Jewish cadets play as Americas next leaders. He emphasized that you cant lead others if you cant lead yourself; dont let emotions cloud your judgement. ment to the military and the Jewish people. As ber that we are defenders of the United States, while ensuring we remain steadfast advocates for our Jewish community. Hearing from active-du that sense of patriotism and pride. The conference ended Sunday morning with a round table discussion featuring Chaplain (Maj) Sarah Schechter, USAF Academy Chaplain; Chaplain (Capt.) Menachem Stern, Ft. Hood Chaplain; and Herschel Sheiness, Commander of San Antonio Post 753. I moderated the panel as they chatted about leading the Jewish people, JWVs role in helping veterans, personal experi ences in the military, and interesting anecdotes from the panel members. Perhaps the most rewarding aspect of the whole weekend was being able to get to know the cadets individually. We talked about our backgrounds, my deployments, and made both personal and military connections. In addition to sponsoring the event, the Jewish War Veterans Foundation (JWVF) purchased kippot for each of the participants and I also gave them lapel pins Jewish Warrior Weekend is a wonderful op portunity for young cadets to meet other Jewish known they are not alone. JWVs role for the fu ture is clear: we must let cadets and military per sonnel know that we are available, and that we will support them. I am thrilled that the JWVF sponsored this wonderful event. We cant wait to see what hap Jewish Warrior WeekendContinued from page 1 is more than bullets. The gritty reality she reveals removed from everyday US civilian life. In 2014, Pearsall participated in JWVs 119th Convention in Charleston, SC. JWV members posed for full portraits and headshots as part of her Veterans Portrait Project. Like her current ex hibit, the compelling images project personality and drive you to ask, whats their story? Visit her website at http://stacypearsall.com/ to review her full collection. Memorials in Pencil by Emily Prince In the early years of the War on Terror, artist Emily Prince began reading obituaries of the de ceased to put a name and a face on the losses that had become a montage on TV. She soon created pencil sketches of the fallen, on paper that corre information, she also included a few sentences about soldiers. The archival project features chronological pieces from June 2009 to May 2012 displayed in a dizzying grid-like order; from a distance, the installation could be a scrabble board. The chaos of the layout is representative of the scale and depth of loss, grief, and memory. It is eerie to see the painstaking detail Prince put into every portraitover 2.500 hand-drawn sketches. Up close, you can see every line and read the words she has lovingly inscribed at the top. Each portrait lists the birth and death dates of the subject, a reminder that they are gone too young and too soon. While only four of the artists are featured here, all six installations showcase the one weap on that has remained throughout all warfare, the human mind. The men and women behind the battles America has been waging since 2001 are displayed and honored in every collection. Less than one percent of Americans currently serve in the military. The Face of Battle shines a light on their reality and compels the rest of the nation to The exhibit is open until January 28, 2018 at the National Portrait Gallery in Washington, DC. Learn more by visiting their website: http:// npg.si.edu. PFC Eric D. Soufrine is, sadly, one of the names on the list of Fallen Heroes, which remembers American Jewish casualties of Operations Iraqi Freedom, Enduring Freedom, and New Dawn. Photo courtesy of Cindy Chambers. Review: The Face of Battle Continued from page 3 Participants from Texas A&M working hard welcome bags provided by JWV! Photo credit: Danielle Freedman, Texas A&M Hillel. Cadets gathered to say Kiddush before Shabbat lunch. Photo credit: Danielle Freedman, Texas A&M Hillel. 16 NEW MEMBERS DEPARTMENT AT LARGE Linda Faust-100 Larry Schapiro-100 DEPARTMENT OF CALIFORNIA Barry Benn-185 Irving Garber-680 Jack Kaplan-603 Robert Taylor-617 Sheila Kodimer-603 DEPARTMENT OF CONNECTICUT Alan Laites-51 DEPARTMENT OF DELAWARE John Elzufon-747 DEPARTMENT OF FLORIDA Georgi Jasper-202 Harry Katz-300 Harvey Levine-321 DEPARTMENT OF MARYLAND Kevin Kent-167 DEPARTMENT OF MINNESOTA Leonard Wall-331 DEPARTMENT OF NC & VA Daniel Helmer-95 DEPARTMENT OF NEW JERSEY Charles Rand-126 Gerald Singer-972 Karen Slutsky-126 Neal Slutsky-126 DEPARTMENT OF NEVADA Harold Schwartz-64 Karen Uslan-64 Mark Uslan-64 Reginald Underwood-65 Romy Schnitzer-Cook-65 DEPARTMENT OF NEW YORK Bruce Weinfeld-425 Eugene Vooss-425 Herman Soblick-652 Samuel Katz-41 Stephen Scheffer-126 DEPARTMENT OF OHIO L. Shalom Plotkin-44 DEPARTMENT OF PENNSYLVANIA Jack Barbash-98 DEPARTMENT OF SOUTHEAST Aaron Jaime-112 Aleksandr Jukowski-112 Alex Smoot-112 Austin Price-112 Benjamin Payne-112 Benjamin Jensen-112 Cesar Legaspi-112 Christian Mitchell-112 Christopher Fowler-112 Cody Hall-112 Daniel Halpern-112 David Lake-112 Drew Wright-112 Dustin Burgess-112 Hayden Green-112 Jacob Higham-112 Jacob Raymond-112 John-Fredeluis Nyiambayu-112 Jon Walmsley-112 Joshua Javenduer-112 Joshua Vanover-112 Justin Heller-112 Kellogg Kellogg-112 Louis Brown-112 Luis Espinal-112 Marc Weinstein-112 Michael Holt-112 Nathaniel Kerendian-112 Nicholas McMurray-112 Rashad Davis-112 Scott Tafoya 112 Seth Rasmussen-112 Tanner Squier-112 William Urban-112 Charles Lutin-112 Jesse Ehrenfeld-121 Louis Lipsitz-320 DEPARTMENT OF SOUTHWEST Franklin Martin-210 DEPARTMENT OF TALO Samloff Alexis-755 Kramer Brianna-755 Pody David-755 Everett Hannelora-755 Bogdan Jared-755 Segal Rebecca-755 Schlossberg Ryan-755 Kamin Wyatt-755 Bugalla Zachary-755 % M azel Tov to Lt Col Alan Winner, Ret ., of Post 201 out of France and England during WWII, after which he met his wife, Sylvia. They have been married for 70 years. % P ost 54 IL Commander Howard Goldstein was honored on Thursday, March 23, by Illinois Governor Bruce Rauner for his volunteer work at Hines VA Hospital, other veterans organization, and the Red Cross. Keep up the % A sp ecial shout out to Post 753 TX for their great May 2017 newsletter. They got permission to reprint articles, they give kudos to all the deserving, and the Post offers rides to their monthly meetings. & PLACES PEOPLE REUNIONSContinued from page 10things mean something. He then offered me some suggestions. Talk to God, he said. He asked me if I pray. I lead prayer, I told him. Yes, he said, But do you pray? I told him I did when I was leading services, but it felt like a one-way conversation, and I never did on my own. He said, Talk to God. It need not always be in the context of prayer. Watch Teviah in Fiddler on the Roofhes constantly talking to God. He even kvetches at God. In retrospect, this was helpful advice. Judaism is often so con nected with the concept of communal prayer and gathering, we forget our own personal relation ship with the divine. In the privacy of the small trailer I called home, the gentle swaying of prayer became the embrace of an omnipresent parent. Discovering faith and the need for an adult understanding of God helped me become a bet ter lay leader. I was able to lead short discussions with the congregation, conversations which were sorely needed to share the extraordinary cir cumstances in which we found ourselves. These discussions dealt with hard topics, like the loss of one of our own to a roadside bomb. Another coming to terms with cleaning blood out of one Its almost ten years to the day since I was sent to Iraq. Since then, Ive retired and settled down outside a small rural village in upstate New York. I still pray twice a dayI make time for spiritual exercise as well as physical. I spent four years as President of my congregation, and still lead a service once a month. Do I approach faith with the surety of a child? No, I dont. Im challenged by it, intrigued by it, and know that whatever it is, it is a part of me. I mean wrestled with God? Much like with the regular cycle of reading Torah, we read the same scripture repeatedly, and while the words don't change over time, we and our world do. So we tease out new meaning, new relevance, and new ways to use it as a prism with which to view our selves, our lives, and God. So long as I continue A Lay Leaders Journey into the Jewish Faith % The 71st reunion of the 106th Infantry Division Association will be held from September 1317, 2017 in Kissimmee, Florida. For more information, please go to http://106thinfdivassn. org/reunion2017.html or contact Wayne Dunn at 410-409-1141 or WayneDunn@comcast.net. MO-KAN Post 605 and the JWV Department of Midwest participated in the Independence School District (ISD) Army JROTC End of Year Awards Ceremony on April 18th at Van Horn High School by presenting the JWV JROTC Americanism Award and bronze medal and their ability to maintain excellence in academics and showed exemplary unit leadership potential. Photo credit: Marv Korn (far left) and Larry Gordon (far right). 17 I have very fond memories of connecting with JWV members when I was a cadet at West Point. JWV members attended services every Friday on campus, many of whom were veter ans of World War II, and some had liberated concentration camps. I remember listening to their stories and being inspired by their cour age. It was a beautiful thing to have multiple generations of servicemen and women gathered together in one place, one community. 4. If you could improve, or completely invent, a JWV program to improve our service to vet erans, what would you do and why? JWV already runs many excellent and com mendable service projects, and I believe we should challenge ourselves to do even more to mobilize and engage the younger generation of Jewish veterans. I would like to see us 20and 30-somethings be involved not only in JWV, but also in making our communities better. We can apply the leadership skills we honed on the hoods and our country. Civilian service can take our own way of making our communities stron ger, itll do a world of good. 5. What display of patriotism, in your com munity or otherwise, makes you most proud? For me, true patriotism is demonstrated by actionsactions rooted in the values that have always made this country great. My favorite example is a broad one. I live in a community of dedicated public servantsteachers, health care professionals, Federal workers, and mili tary personnelall of whom go to work every day to make our country smarter, healthier, better-run, and safer. What prouder display of patriotism could there be than that? 6. What is your favorite Shavuot tradition or memory? My father and I love cheesecake, and well take any excuse to eat it. We spent many hours town. I think its a genetic issue. So when it comes to Shavuot, I really have to start with dessert. Robin Hood: Men in Tights. Want to get to know your fellow JWV Members? Then lets play 7 questions! Contact Mara Sherman (msherman@jwv.org) if you know of a Member we should feature. Vietnam Veterans Committee By Bob Jacobs, Vice Chairman We have a meeting scheduled for the National Convention in San Antonio and an agenda is be ing developed. We invite all members of JWV, whether a Vietnam veteran or not, to attend our meetings and see what we are all about. The various echelons of our organiza tion continue to plan events to commemorate the 50th Anniversary of the Vietnam War. We have planned a Night Out during the National Convention at the Saltgrass Steak House. Further information will be published in the preconvention information packet from National, and is available at http://www.jwv.org/events/ convention. We will have the President of the local VVA (Vietnam Veterans of America) chapter and pos sibly several chapter members joining us for din ner. The president of the chapter will address us and tell us what Vietnam veterans are doing locally. We also continue to collect the stories of Jewish veterans who served during the Vietnam Era, whether "boots on the ground" or wherever Uncle Sam sent you. If you haven't yet submitted your story (which will be placed in our museum's interactive program), please bring it to conven tion or send it to the committee Vice Chairman Bob Jacobs at conrailbob2003@yahoo.com. It should be about 1-1 1/2 pages with both a then photo and a now photo. We hope to eventually publish either a book or a disc containing the sto Museum of American Jewish Military History. Development Report PNC Monte Mayer, Chairman Development covers the fundraising arm of JWV by direct mail programs. This is accom plished by creating the annual calendar, mailing labels, High Holiday cards, and a special mail ing directly to donors who may be non-members. There may also be year-end mailing in the event the IRS may allow those with an annual take down of an Individual Retirement Account, that if directed to a charity or in particular a veterans organization, that the take down is not taxed as income. We also remind our members that there are also opportunities to remember JWV via legacy planning in your Will, Trust, or Insurance Policy. We attempt to remind our members and do nors who know of our activities nationwide that we enjoying featuring moments and memories both in our calendar and in issues of The Jewish Veteran We want to know, and to remember, your actions when serving in our military, and Committee Reports 7 Questions with a JWV MemberContinued from page 6that is the purpose of our calendar. We constantly ask for photos, and a short biography (no more than 200 words) describing the time in service. 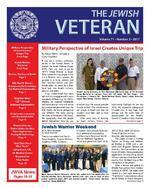 National is always accepting article submissions for The Jewish Veteran. We want to know how your Post fundraiseswhat worked, what didnt, what events youve done, how you publi cize, etc. To learn about the submission require ments for both the paper and the calendar, please email jwv@jwv.org. Education Committee By Hannah Deutch, Vice Chair The former Jewish Affairs Sub-Committees per taining to the Holocaust, Israel Bonds, JCRC, and Jewish Poor have now been consolidated under the Education Committee, a prudent deci sion considering that we have been educating the public on the Holocaust for many years. Since I retired in 1982, I have participated in its efforts, and now as Vice Chair I will tell you how in volved we are in New York State. I am glad to report that I am not alone in my efforts, as some of our Liberator comrades have been telling the public about their experi ences during WWII. I work primarily with the Kupferberg Holocaust Archives and Resource Center at Queensborough College and am also listed on various Speakers Bureaus. duce you our work in New York. This year I spent seven months with the students of Ramaz Jewish (including mine) which were then dramatized as a play and presented April 23rd/24th for Yom Hashoah for nearly a combined 1200 people. If anyone is interested to see the video that was made, you can contact me via email at hdeutch@ nyc.rr.com and I can get the link from Ramaz. The second annual event is the United Nations International Day of Commemoration for the Victims of the Holocaust, which takes place annually on January 27th worldwide. As 2017 is ongoing, this represents our ef forts thus far. In future reports, I will continue to inform you all on our progress and impact. Want to get involved in a JWV committee?Send an email to JWV@jwv.org with the subject "Interest in a committee" and tell us about yourself and professional background. 20 In the archives of the museum, there is a 1909 program from the Hebrew Veterans of the War with Spain (one of the organizations that even tually became JWV) 10th Anniversary Banquet and Ball held at the Palm Garden in New York. It mentions the need to refute the anti-Semitic libel that Jews do not rise to the challenge of taking up arms to defend his country. It goes on to say the wounds borne by many of our comrades, the empty sleeves and trouser legs, are all the refuta the anti-Semites to sleep. 108 years later, were still trying to make sure people are aware of the wounds. Hopefully, this isnt just to refute antiSemites. I want it to be a way to instill pride in the Of course, the way we do this is much dif ferent than in 1909. Its even different than it was in 2014. As my term as museum president ends in August, I look back on the past three years. Im proud of what we accomplished, including opening a major new permanent exhibit with multimedia components alongside historic ar tifacts. Weve also launched a brand-new web site thats continually updated. Were using so cial media and online content platforms like the Google Cultural Institute. We have partnerships with Amazon to sell our exhibit catalogs and oth er books. We also have our own online store so people can order museum products all over the world directly from us. Were a far more mod ern museum then we were three years ago. Its enabling us to reach more people on a smaller budget than ever before. While weve made progress, we need to do much more. The museum can continue to improve with more content, more extensive educa tion programs, more new exhib its. Ill continue to work towards that goal. I hope everyone joins me. Together we can use every method at our disposal to ensure that the world is aware of how Jews contributed to our country. Lets ensure the message of the Hebrew Veterans of the War with Spain is not forgotten.Program Updates By Mike Rugel Program and Content Coordinator On April 2nd, author Frank Lavin spoke at the museum about his new book, Home Front to Battlefront: An Ohio Teenager in World War II. The book is based primarily on letters sent home by his father, Carl Lavin, a high school senior in Canton, Ohio when Pearl Harbor was attacked. He enlisted and served with the 84th Infantry Division in Europe including the Battle of the Bulge. Along with Lavins descriptions of training and serving in Europe are anecdotes about JWV. For some reason or other he wrote, the Jewish War Veterans of Canton decided to send me a package of pin-up girls. Very sweet of them. But theyre behind the times. The magazines say that the army doesnt like pin-ups anymore. You can hear more about Frank Lavins book and his fathers experiences in his full talk on our YouTube channel at https://www.youtube.com/c/ NMAJMHorg. This year is the 100th anniversary of the U.S. entry in World War I. To acknowledge the centennial, we partnered with the Jewish Historical Society of Greater Washington (JHS) for an event at the museum on Jewish life during the Great War. Among those who attended were several board members of the historical society, each of whom expressed an interest in continuing to work together on these types of programs. Many of the attendees said they were glad to be visiting the exhibits. Museum historian Dr. Sheldon Goldberg gave a presentation on the role of American Jewish service members in the war, while JHS curator Christiane Bauer spoke about Jewish life in Washington, D.C. during the same period. Included in Bauers presentation was a photo of Simon Wolf, standing under an American day after the countrys entry into WWI in 1917. During the war against Germany, the photo illustrated the importance of showing patriotism at a congregation that was created by German immigrants. Wolf himself was an immigrant from Bavaria. As the author of the 1895 book, The American Jew as Patriot, Soldier and Citizen, Wolf is a key military history. The book contains a history of Jews in the Revolutionary War, War of 1812, and the Mexican War. Most importantly, Wolf attempted to list the name of every Jew who served in the Civil War. Wolf himself was an honorary member of the Hebrew Union Veterans Association, the original organization that eventually became the Jewish War Veterans of the USA. Wolf also corresponded with Mark Twain, and it was likely his book that led to Twains retraction of the statement that Jews had an as a soldier. In his retraction, Twain quoted one of the letters in Wolfs book, written to Wolf by General O.O Howard: there are no more patriotic men to be found in the country than those who claim to be of Hebrew descent.Presidents MessagePNC Joseph Zoldan President, NMAJMH Christiane Bauer, curator of the Jewish Historical Society of Greater Washington. Frank Lavin spoke about his book, based on letters sent by his father during WWII. A History of Jews in BaseballJuly 16 1:00 pm At the Museum Phil Wood will join us to discuss the history of Jews in baseball including Hank Greenberg and others who served in the U.S. military. Wood is the host of Nats radio show of the Washington Nationals. He's a long-time radio personality in the D.C.-Baltimore area and an expert on the history of baseball. 21 By Pamela Elbe Collections, Archives & Exhibitions Coordinator Millions of American families sent their sonsand, for the serve in uniform during the Great War. Over the relative ly short course of U.S. par ticipation in the war, 116,516 American servicemembers gave their lives. Another 204,000 were wounded. More than 4.7 million Americans served in the U.S. armed forces during World War I. Isadore Greenberg and Frank Brooks were two young Jews who an swered the call to serve. On October 18, 1918, Private Isadore Greenberg was serving as a runner for the 16th Infantry when he saw his regimental commander, Colonel W. F. Horrell, go down after catching a German bullet in the shoulder. Greenberg recalled, We had orders there was a gas attack. The colonels gas mask was hit and I said, Your life is more important than mine; take my mask. I gave him my mask and dressed the wound and put a tourniquet on it. Moments later, Greenberg volunteered to serve as spotter for a blind one-man tank, running beside it and telling the gunner where to aim. With his assistance, the gunner knocked out two German machine gun nests. Then, as Greenberg held more than two dozen surrendering Germans at gunpoint, a bullet While Greenberg received a testimonial letter from his colonel citing his courage, that was all. That is, until a 1977 Israel Independence Day celebration in Miami, Florida. Senator Richard Stone, the guest speaker at the ceremony, began telling the story of a young World War I hero whobecause of a slipup in military recordkeeping had never received the Silver Star medal that he had been awarded. As Stone was speaking, Greenberg slowly realized that the daring young private he was talking about was him. An honor guard escorted him to the stage as people applauded, drums rolled, the senator pinned a Silver Star medal on Greenbergs chestthe medal that he was supposed to have received 59 years earlier. Private Frank Brooks served in the US Army with the 11th Engineer Regiment (Railway) during the First World War. It was one of three regiments activated to maintain railroads in northern France in support of the American deployment and the overall war effort. The 11th Engineers landed in France in August 1917, the the European theater. The unit was sent to the Somme, where they were tasked with preparing the rail lines for shipment of equipment to the front. On 20 November 1917, elements of the 11th were repairing a section of railway track when a British attack launched the Battle of Cambrai. In Gouzeaucourt on 30 November, in a desperate counterattack, the Germans penetrated British lines and overran the engineer work site. Fighting back with pickaxes, shovels, and position. The British rallied around the engineers site and forced the Germans to withdraw. Thus, American units engaged in World War I. For its valor, General John Pershing and Field Marshall Douglas Haig commended the Regiment. The Battle of Cambrai resulted in a great reported losses of dead, wounded, and missing of 47,596 between 20 November and 8 December. Of these, some 6,000 were taken prisoner in the enemy counterstroke on 30 November. The Germans estimated their casualties to be around 41,000 men. Frank Brooks was among those taken and an Englishman by birth (though a naturalized American citizen living in New York in 1917), Frank and his brother Phillip both enlisted in the Engineers when war was declared. The day before the battle of Cambrai, their sister Blooma received a letter from the brothers saying that they were happy and expected to take part in an important movement soon. The next she heard was the report from the government that Frank was a prisoner. Frank was among 17 American engineers captured on at Gouzeaucourt. He was sent to the prison camp a Tuchel, Germany. He spent more than a year as December 17, 1918.Members of the 11th Engineers, taken prisoners by the Germans at Gouzeaucourt, France, on November 30, 1917. Frank Brooks is 6th from left. Remembering the Great War on its Centennial Letter from Col. W.L. Horrell thanking Isadore Greenberg advance with line in battle. 22 TAPS IN MEMORY OF OUR DEPARTED COMRADES DEPARTMENT AT LARGE Beston Jack Abrams-100 Benjamin Ettelman-100 Richard Kingsberg-100 Harry Roberg-100 Marvin Romerstein-100 Ira Rosenberg100 William Schimmel-100 DEPARTMENT OF CALIFORNIA Donald Fishstrom-60 DEPARTMENT OF CONNECTICUT Ronald K. Jacobs-45 Milton B. Hollander-142 DEPARTMENT OF DISTRICT OF COLUMBIA Jack B. Ralph-58 DEPARTMENT OF FLORIDA Murrel Winner172 Kenneth Braidman-243 William Tatel300 Leonard Frumin-321 Richard Rock-606 Gerald Steinberg-819 DEPARTMENT OF ILLINOIS Allen S. Warshaw-407 DEPARTMENT OF MIDWEST Larry Martasin-605 Leonard Korman-644 DEPARTMENT OF MARYLAND Jacob Albert-167 Joshua Roseman-167 Martin E. Chaitovitz-888 Rudolph Cohen-888 DEPARTMENT OF MASSACHUSETTS Irving M. Cooper-32 Harold W. Gurwitz-32 Everett M. Joseph-32 Sherman Plotkin-32 Sidney R. Stein-32 Arthur Fishtine-157 Hyman Zamansky-211 Melvin Lewis-302 DEPARTMENT OF MICHIGAN Harold Podolsky-474 DEPARTMENT OF MINNESOTA Robert Loewenstein-162 Edwin Smith-354 DEPARTMENT OF NEVADA Irving Finver-65 DEPARTMENT OF NEW JERSEY Morris Rosenstein-47 Wolf B. Topchik-47 Rudy Polack-76 Murry Opatosky-125 Melvin L. Aaranson-126 Edurdo Rivero-126 Lewis M. Bloom-133 Harold S. Light-395 Leon Rosenberg-444 Leon Jaffe-498 Charles M. Roman-741 DEPARTMENT OF NEW YORK Joseph Diamond-25 Jerome Greenberg-25 Harold Feinberg-41 Leonard Selk-69 Leonard Shniper-206 Alan Handelsman-415 Neil K. Siegel-488 Irving Weiner648 Leon Schwarzbaum-717 M. N. Cember-720 Max Graber-724 Paul Weitman-724 DEPARTMENT OF OHIO Harold Simon-44 Jack M. Lederman-62 DEPARTMENT OF PENNSYLVANIA Morris J. Zibelman-98 Arthur Z. Jurkowitz-165 Jacob Weinberger-215 Andrew Flager697 Ronald Harvey697 DEPARTMENT OF SOUTHWEST Alfred E. Lipsey-201 Stanley A. Dolin-619 DEPARTMENT OF TALO Rowan W. Blatt-256 Donald Bruce-256 Joel M. Mayers-256 Allan H. Minsky-256 Daniel Morguloff-256 Florence F. Rosen-256 Joseph G. Schneidler-256 Daniel Alexander-580 DEPARTMENT OF VANC David Wolfson-155 Melvin Slusky-158 Gerald Lipson-299 By Chuck Ashman, Deputy Commander JWV California Sgt. Alvin York, the legendary Medal of Honor to have a VA Medical Center bear his name in Murfreesboro, Tennessee. The second, Audie Murphy, was the most decorated soldier in World War II. His name is on the VA Center in San Antonio, Texas. This spring, the Long Beach VA Medical Center welcomed fellow Jewish War Veterans, friends, and family of their most famous and beloved former patient and volunteer, Tibor Rubin, to rename the Center in Rubins honor. Lt Colonel Robert Huntly, Tibors nephew, spoke for the family. Just days before that ceremony, the past president of the Medal of Honor Society, Air Force pilot and POW Leo Thorsness, passed away. He had described Tibor as a heros hero and re mained mindful of how Tibor had used what he learned as a boy in a Nazi concentration camp, to help other POWs survive after he was captured. For years, Jewish War Veterans leaders and Tibors relatives joined U.S. Congressman Al Lowenthal in lobbying to have the nations highest award presented since it had been put forth four times for Tibors one man army exploits and his dedication to others in the POW camp. The halfcentury delay had clearly been caused by anti-Semitism when Rubin was In early 2015, then National Commander Maxwell Colon, NEC member Mathew Millen, and California Department Commander Greg Lee went to Capitol Hill only to learn that regulations prohibited naming a facility for any veteran while he was still alive. He passed away on December 5 of that year. Just over a year later, President Barack Obama signed into law a bill changing the medical centers title. Jewish Secretary of Veteran Affairs in our na tions history approved by the Senate, the namechanging ceremony took place among hundreds of friends and fans who knew and loved Tibor for his humanity and sense of humor. National Commander Carl Singer shared the remarkable story of Tibor Rubins combat con quests, his POW camp leadership, and his dedica tion to those at the hospital where he was treated. Darin Selnick, a former California State Commander, is the Senior Advisor to the Secretary and had brought the formal documents signed by President Obama authorizing the name change. The hospital administration arranged for a portrait of Rubin, which was unveiled and will have a place of honor within the medical facility. Meanwhile, the JWV Department of California shared their documentary honoring Rubin and the 16 other Jewish American heroes who had received the nations highest honor. As the ceremony concluded, there was a star tling roar from the gray skies where the crowed was gathered under a huge tent. Some thought it with its unmistakable deafening sound. Others thought the Lord was expressing appreciation for the ceremony and welcoming Tibor Rubin to his new home.And Then There Were Three Long Beach, CA VA Medical Center Renamed for Tibor Rubin Members of the JWV Department of California and National Commander Singer (far right) proudly display Tibors portrait.